Check out the article I wrote about my work with mentor and master teacher Nancy Topf in the current issue of Contact Quarterly. Learn more about Dynamic Anatomy/Topf Technique, the history of Release Technique and the context in which this movement work developed. 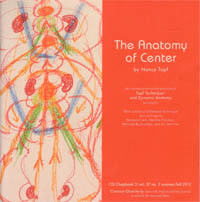 Contact Quarterly will publish an Issue in May/June devoted to master teacher and choreographer Nancy Topf. The issue will include lessons/practices from her manuscript in progress as well as articles written on the context and development of her work within the lineage of ideokinesis and anatomical release technique. I have written a piece on my personal experience as a young artist working with Nancy Topf. It will be a great source of information and inspiration for embodied practitioners, teachers and students. Today we worked with voice in studio. I am less interested in seeing what a performer is “doing” or what they can do –and more interested in how they are “being” and how is the quality of their attention. We can follow the voice, let the sounds be what they are and not judge the tenor, pitch, or any other part. The voice can be beautiful, ugly, kraggley, soft, animal like, sweet, silky, stuttering, a whisp. The focus is on locating an easy inner initiation and then following that into the unknown. The breath. This traveling leads through feelings and worlds. Other cultures arise and dissolve, so does our own ancestry, darkness and the light. I picked up this small book while browsing Spoonbill Bookstore in Williamsburg, Brooklyn. This is a collection of some sixty Polaroids with intermittent text. Dance is not beholden to narrative and can exist without translation via language. It is something else, entirely ephemeral, and containing its own logic. Dance is direct, tangential, running amok, fast, slow…like snow and irreverent in its ability to articulate its own poetry. Translation made me think of transfiguration, something about figure/change. Right? So I checked the definition: A marked change in form or appearance; a metamorphosis. Yes, certainly dance can do that. Then, I wondered if trans-culturation was indeed a word. I thought it was a word I used to know. So I looked it up… it is. It is a bit more complicated since it points to the addition of new or foreign cultural elements into an existing culture (political and historical implications there). Yes, dance can move in that way too. Dance needn’t resolve; as in wrap up a contradiction or finish, as in a story. Rather I see making dance as posing questions and laying bare a kind of thinking in the physical, the choreographers or improvisers thought process literally “fleshed” out. Finally I tried trans-nonlinearation just for fun… nope, not a word. So I stopped, my luck ran out. Still I couldn’t help myself….. I notice that I subvert my initial proposal. I was speaking of dance. Ahhhh… dance can do that. Hello! This blog is for current research, teaching updates, documentation of ideas and pieces in progress, writings on art and culture (non fictional and fictional) and anything else related to my work. Please stay tuned for new postings in the weeks ahead.